“Natural Light Photographer” Is It In Your Vocabulary? Why? There is nothing wrong with natural light and a great photographer will know how to use it effectively. However, are you calling yourself a "natural light photographer" because you cannot afford a setup like you see on the right? because you don't have a studio? because you don't own an on camera flash? Well, STOP using... "I'm a "natural light photographer."... as a way out of not using strobes or flash in your photography." You don't have to have a setup like you see to the right to get start using strobes and flash in your photography. Photography gear can get expensive; however, don't let cost or lack of owning something be your way out of expanding your work. 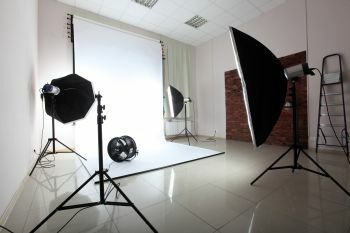 You can get studio type, beginner level lighting for under $500 or even under $300 if you are on a really tight budget ( Read More Here ). But you don't have to have studio type lighting right away. You really should own an on camera flash first. You can purchase an off brand TTL Flash for under $200 from Amazon.com ( See Yongnuo 568 EX II which a friend of mine who shoots with a Canon 70D owns and loves ) or purchase the same brand as the camera you own which will likely be $350-$500+. In either case, the flash is likely a small expense compared to the camera kit that you own that may have been $700, $1,000 or even $1,500+. In addition to the on camera flash, you should also get something like the Gary Fong LightSphere, so you will not be using direct flash on your subjects. An on camera flash can be used inside and out. It's a great way to fill in shadows when shooting outside. If you prefer to BUY LOCAL, SUPPORT LOCAL, check with the local camera store(s) in your area to explore options. The nice thing is that they can provide additional advice on studio lighting and on camera flash.